The boys went clamming at the beach. Generally you'd use a rake and rake them up. We didn't have a clam rake. That was OK. 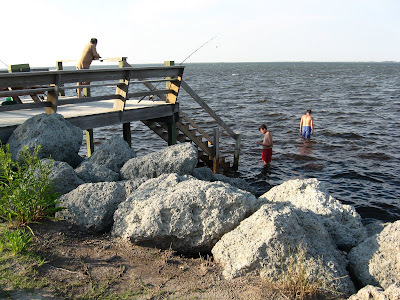 In the shallow water, you can feel around with your feet or your hands and find the shallowly buried clams. This is rather like an Easter egg hunt. I suppose it would get old if you lived at the beach, but it's fun on vacation. "Hey. Look. I found a big one!" Actually the small clams are better for grilling, but it is fun to find the monster of clams. The big clams work out great for clam chowder. I made up a Southern inspired clam chowder, since the boys really are not all that keen on the flavor of clams. If you are going to use clams in a recipe rather than steaming them open on the grill, then a good tip is to freeze them. A guy at the shrimp shop told us that and also some professional clammers who happened to stop and clam in front of the vacation rental house. Once the clams are frozen, they pop right open. Otherwise, it's hard to open clams. As far as clams on the grill - really easy. I wrote up the directions for Grilled Clams at Yes You Can Grill. I like to do my recipes right after I've made something, so I will be sure to include the little details that might slip my mind with time. I really hate to get a recipe and have a flop, because a little step is not included. If you do get out to the beach or in a saltwater area with shallow water, ask about clams. It really is fun to go clamming. Check on the laws for the state. In North Carolina, for example, there's a limit of 100 clams per day. Whew. That's a lot. We never came close to the limit, but it's still good to know what's OK and what's not. Clamming sounds like such a fun event! We don't have an ocean near us anymore, but when we were younger I remember our family taking part in a neighborhood clam bake! It was so memorable! Oh. It is fun to clam! We're not real close the ocean now but close enough to go now and then.